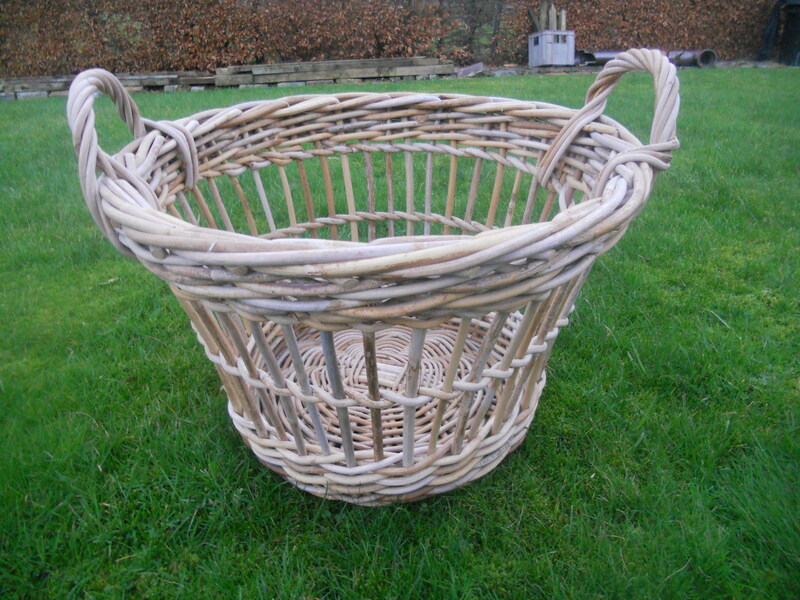 Alisdair Davidson is a basketmaker who spent several years in the 1990’s researching baskets in Scotland and has helped us considerably with the research for this project. Originally from Kilbarchan, he worked as a toolmaker in Glasgow before moving to the Isle of Arran in the 1970’s to recuperate from illness. After working for a while as a leather worker on Arran he got into basketmaking by working for a local basketmaker Henry Mellor who had a contract for making fish landing baskets for the docks at Grimsby. According to Alisdair, Henry Mellor was a social worker who started making baskets to make money when he was on strike in Yorkshire. He liked the basketmaking so much that he gave the social work up and carried on making the baskets even after the strike was over. At this time he was working for the Rochdale Skip Company and when they closed he took over their contract for the fish landing baskets. 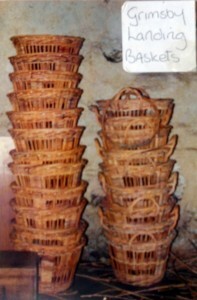 He continued basketmaking when he moved to Arran in the early 80’s with his family and it was here that Alisdair met him. He needed help keeping up with the fish landing basket contract and taught Alisdair, who was living near his workshop at Corriegills Farm on Arran at the time, to make them so that he could help. These baskets were used to lift the catch of fish off the boats at the docks in Grimsby, England. The dockers used to drag the baskets full of fish across the docks so they soon wore out, and only lasted a week. The contract was to make as many as possible, and they often made around fifty so plenty to keep Alisdair and Henry busy! By coincidence Alisdair ended up living and running this business from a place in Glen Cloy where a basketmaker lived between the wars. He described how he met the wife of this basketmaker standing on a bridge near the house looking distressed. It turned out that her husband had nearly drowned once in the burn under the bridge. After resting for a while in his workshop she came to and was able to recognise and name the baskets he was making. Alisdair explained ‘She raised her kids here, in our house and he worked as a farm labourer, come shepherd. And in the off-season he made baskets. and she is the first woman who has not been involved in basketmaking, who has looked at one and given me it’s name and said ”are you still making them? My man used to make them”. It explains a lot because just by the house here, it was all willows and they were all multi limbed, so it was old coppice’. Its seemed that the farm labourer who lived there made a variety of baskets including line baskets and a type of seaweed carting basket for horses made with bits of wood and open willow work..
Alisdair’s interest in Scottish tradional basketry led him to apply for funding to do more research and in 1996 Alisdair got funding from the Scottish Arts Council that enabled him to travel the length and breadth of Scotland studying baskets in museums and photo archives. As part of this research he made replicas of traditional baskets and, in museums and schools, he demonstrated how they were made. 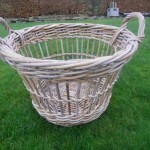 This work led him to get a lot commissions from museums, including amongst other things making a replica of a 1,500 year old basket found in a peat bog in Shetland for the National Museum of Scotland in Edinburgh, replicas of several back creels and a chair for the Museum of Highland Life in Kingussie, and replicas of baskets used in the production of salt for Preston Grange Industrial Museum in East Lothian. Alisdair also enjoyed the challenge of making replicas of traditional baskets just for the sake of it and has replicas of many other baskets around his home, including coiled baskets that are replicas of ones found in an archeological excavation of Perth High Street (which he made based on drawings as the original had gone missing), grain carrying sacks that he made also based on drawings this time in Dwelly’s gaelic dictionary and replicas of Orkney cubbies (see seperate articles about these baskets). Today due to health reasons he does a lot less basketry but still retains a strong interest and has helped us considerably with this project.